The Anglo-Dutch consumer products outfit is suffering from slower growth in the developing world. Brazil and India are tricky and currency swings are hurting too. 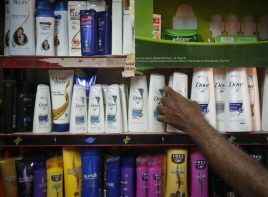 Unilever has to be wary of complacency. But its broad plan, to run hard at faster-growing markets, remains right. After Obama’s veto of a U.S. trade agency ruling, courts look like patent warriors’ last chance to stifle rival products. Even that option may vanish if Apple loses its bid to block Samsung’s devices from the U.S. market. Peace – and real competition – may finally get a chance. The private equity-owned bathroom fixtures maker is mulling an IPO. Possible buyers are circling. Grohe was declared a victim of “locust investors” by a German politician a decade ago. Today it is stronger than ever, even though its mooted valuation looks a bit optimistic. A Carlyle-led group bought the retailer’s wholesale arm for $8.5 bln just before the real estate bubble burst. The firms should recoup on paper their HD Supply investment in the IPO. Home Depot fared better. With the proceeds, it bought back shares – which have since doubled. The French group scrapped talks with milk producer Mengniu five years ago - just in time to avoid 2008’s melamine scandal. Since then, Mengniu has changed its supply chain and become state-owned. Danone’s new $417 million investment looks safer, but the terms look tougher. Today’s prosperous iPad buyers in China may not be swayed by what seems to be state-orchestrated criticism. But the tech giant’s admission of arrogance is a cheap salve to future, less well-informed buyers who might, as the Apple CEO hopes, make the PRC his biggest market. Danish toy maker Lego is setting up a China factory just as British noodle maker Golden Wonder brings production home to England. While rising wages drive low-end manufacturers away, others will find shifting production closer to China’s wealthier consumers makes ever more sense. Shareholders pushed the cosmetics firm’s shares up 20 pct on Tuesday, bringing them near the highs last spring when Coty’s $10.7 bln bid - later dropped - was still on the cards. CEO Sheri McCoy, in the job for less than a year, has succeeded in giving investors hope again. While China is still spending, some brands have lost lustre, judging by warnings from Yum Brands and jeweller Chow Tai Fook. Slower growth is natural as companies hit a certain size, but fast-shifting tastes are a factor too. Investors need new proxies for Chinese consumption. After bulking up with acquisitions all this year, its first as a public company, the buyout firm is now stretching the balance sheet at vitamin maker NBTY to pay itself a $720 mln dividend with PIK-toggle debt. Such juicing may be easy again, but can have risky side effects. Andrea Jung, the former boss of the U.S. beauty company, will relinquish her role as executive chairman at the end of the year. Sidelining Jung is overdue given the mess she left behind. Sheri McCoy, CEO since April, now has a better chance of rejuvenating the Avon Lady. U.S. consumers are cheerier about life. But the corporate world is gloomier. If consumption jumps, it could soothe the business world’s blues. But the weak global economy and dysfunction in Washington are stunting hiring and could drag people down along with executives. Protesters have called for shoppers to stop buying Japanese goods. But past attempts to snub French wine or Danish goods suggest this rarely works. And if Chinese workers attack Japanese factories, they would share much of the pain. Economic war looks reassuringly hard to wage. Revenue at the cosmetics giant is tumbling, and it’s losing sales reps in key markets like Brazil. New CEO Sheri McCoy wants to get back to basics. Yet Andrea Jung, her predecessor and architect of the chaos, is still executive chairman. Any value in her sticking around is gone. The U.S. credit card issuer is paying $210 mln to settle charges of duping customers. The first big enforcement action by the new Consumer Financial Protection Bureau indicates the kind of innovation in its crosshairs. Lenders will have to be creative without being deceptive. Despite all the narcotics-related killings, Mexicans are confident, enjoy higher employment levels and have room to borrow more. Though stock market valuations reflect this apparent conundrum, more profit still may come from consumers south of the U.S. border. The industrial giant is shedding financial assets and trying to reduce dependence on wholesale funding. The newly public EverBank is taking the opposite tack, spending almost double its $1.3 bln market cap on GE’s Business Property unit, leaving it with more loans than deposits. The cosmetics group’s hapless board compounded its enabling of failed former CEO Andrea Jung by offering a wishy-washy response to Coty’s compelling $10.7 billion merger offer. The deal is dead for now: No wonder shareholders’ mascara is running. The down-in-the-dumps U.S. makeup firm has until Monday to engage with Coty’s persistent advances. With the offer raised to $10.7 bln, the addition of Warren Buffett’s cash and blessing, and the possibility of a still higher price, Avon’s European suitor deserves a hearing. Sheri McCoy has inherited an even worse company than thought. The cosmetics company’s collapsing margins led to dismal Q1 results that question the value of the franchise and play right into the hands of suitors like Coty. McCoy needs to prove she can swim, and fast.